Head and neck cancers constitutes about 4% of all cancers in the United States each year. It’s estimated that every year, around 65,000 people are diagnosed with these types of cancer. There are many forms of head and neck cancers, but they are usually diagnosed within patients over the age of 50. 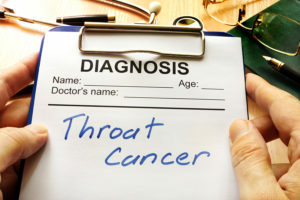 A diagnostic of Throat cancer. After a head and neck cancer diagnosis, targeted treatments are likely the next step in the process. Radiation therapy, possibly partnered with chemotherapy, is oncologists’ go-to option when deciding on the best way to eradicate these cancers before they spread further. Radiation and chemotherapy can be effective, but also take a toll on the physical and mental health of those going through them vigorously. Dehydration, changes in taste, GI issues, and dry mouth due to damage to salivary glands are common side effects of cancer treatments and can often make the treatment journey even harder. One rule of thumb is to remain hydrated. Whether you’re facing dehydration, digestive problems, or dry mouth symptoms, drinking water can lessen the discomfort and promote overall health. Do E-Cigarettes Cause Dry Mouth? Dry Mouth Products: What one is the Best?